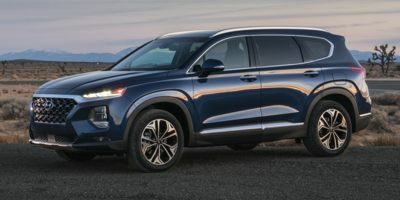 The 2019 Hyundai Santa Fe is a 5 passenger Automatic transmission, 2 Wheel Drive Sport Utility Vehicles or 4x4 Sport Utility Vehicles. It is available in 5 trim packages, the Limited, SE, SEL, SEL Plus, and Ultimate. The new Hyundai Santa Fe invoice price ranges from $24,749 to $36,886, while MSRP ranges from $25,750 to $38,800. The 2019 Hyundai Santa Fe is available in 9 exterior colors, Earthy Bronze, Lava Orange, Machine Gray, Quartz White, Rainforest, Scarlet Red, Stormy Sea, Symphony Silver, and Twilight Black, and 3 interior colors, Black/Beige, Black/Black, and Espresso/Gray.